Carrie: The Musical is playing for two more weeks at a gorgeous old theater on Broadway and you should go see it. Here’s hoping that the November dates will give the show a chance to be heard beyond all the Halloween hubbub. Yes, it’s based on a Stephen King novel and (spoiler alert) everyone dies at the end, but the play is much bigger than all that. The spectacular staging literally transforms the Los Angeles Theatre, the finest of all the downtown movie palaces, by inserting a new theater inside the vintage auditorium. The action takes place inside a steel cube reached by ramps that cantilever out over the original 1931 seating. Peering over the edge down to the ancient loge section listening to the piped-in sounds of water dripping in the dramatic darkness I couldn’t help but think of Werner Herzog’s Cave of Forgotten Dreams. The baroque hall that opened with Charlie Chaplin’s City Lights is just a hulking, dreamy background that engulfs the set, built to resemble a high school gym. The faces of cherubs look down on audience members seated on benches that cast members roll around the stage. My memory of the Sissy Spacek movie is dim, and I never saw the 1988 musical, but this production seems to be less abusive religious fanaticism and more feel-good anti-bullying hero’s journey. Carrie White’s makeover montage is so cheerful it feels almost like parody. In a cast of strong powerful singers, Jon Robert Hall, Jenelle Lynn Randall, and Misty Cotton, as Carrie’s mother, were exceptional. My guest had issues with things like story and character development, but I was simply dazzled by all the stagecraft. Jesus Christ literally flies off the cross and into the audience. Now, that’s showbiz! 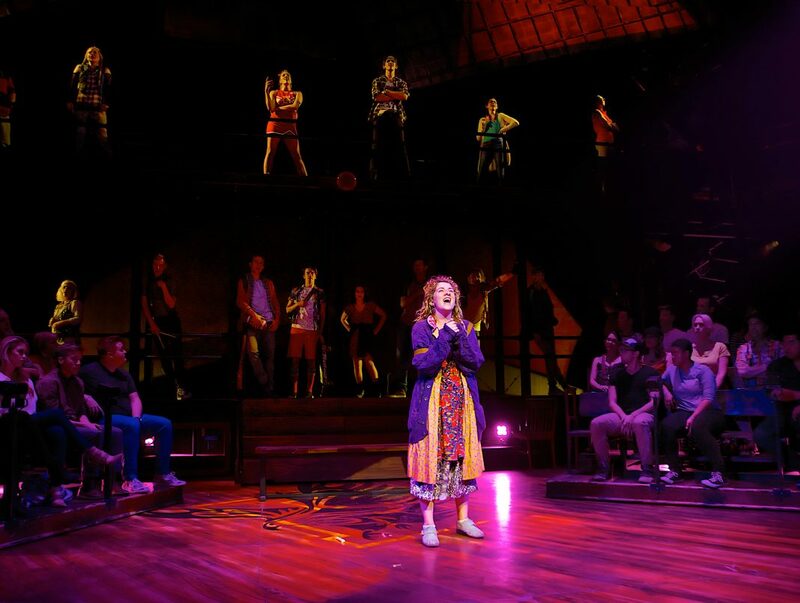 Carrie is a big impressive show stuffed with singing and dancing and telekinesis. It’s all covered with baubles and it’s the perfect thing to lure folks away from their Netflix. I hope it works.